Many small business owners create goals for their company every year. A few owners think this process is a waste of time and decide things as they come. When creating goals, it is important to make them specific and to evaluate your progress. For example, when creating sales goals make them specific in terms of sales numbers (say increasing from $600,000 to $1M), then look at creating specific action steps to achieve these goals. Finally, every month- and quarter-end review the goals and the results. The article How to develop your 2015 Business Goals provides a clear explanation of the process. Once you have determined your goals, you will need to create a good strategy to implement the action steps. Now, how do you create a good strategy, or what is a bad strategy? Most often this is understood in hindsight when we look back at what did not work. Examples makes things simpler. Here is a list of 2015 resolutions created by 25 small business executives. When you setup an OfficeClip account, you are effectively setting up multiple copies of OfficeClip, each independent of the other. The access privilege of various information in organization is simple. You have access to the organization if you are a member of the organization. If an user belongs to multiple organization, he/she can switch between them and have access to the data. You can use this feature to manage information between multiple divisions which are located in different geographic regions or are completely independent. Parent Child Fields - This will allow users to create a custom field that will depend on another field. For example, if you have a field called country and another related field called state, when you change a country to say United States, the state field will only show the US states. Calculated fields - You can add a formula to a field that is dependent on another field. For example, you might want to see how long an opportunity is open. So, you can create a field called "days open" which can be computed as "today's date - opportunity created date". 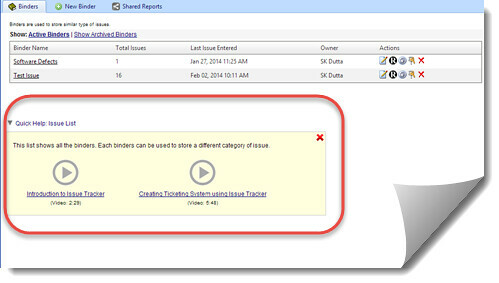 Multi select list - In this release we have added a multi-select list where you can select more than one list items. For example, you might want to keep track of your contact's hobbies. You can create a field called Hobby that has more than one values like Drama and Swimming. These enhancements are available to the Basic (Free) and Enterprise versions of OfficeClip. On Screen Rules: When entering new contacts, it is sometimes necessary to do dynamic validation check or pre-populate some fields based on another field. These can now be done using the On-Screen rules in CRM Admin. This enhancements is available to the Basic (Free) Version of OfficeClip users and well as Enterprise users. Related data count: When seeing related data in various tabs, it is hard to see if something new has come up or if there is any data inside the tab without clicking on the Tab. We added a status on each tab that shows the number of items and if there is anything new in these tabs. 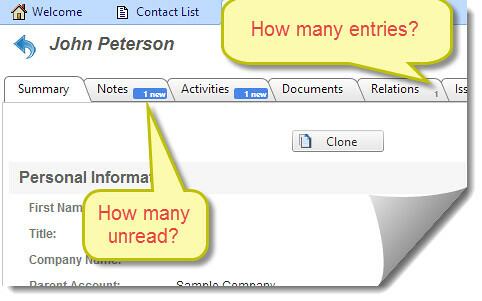 Daily Call List Enhancement: The daily call list now shows multiple day call list grouped by date. This makes it easier to all past (and future) unattended calls. 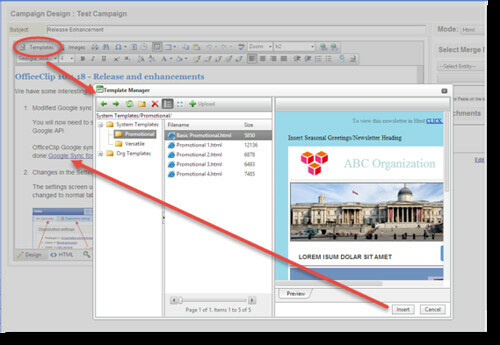 Campaign Templates: OfficeClip campaigns provides ability to create and send campaigns using your own SMTP account without having to pay a third party for sending emails. In this release we provide you with many email templates. You can select any of these templates to create your own professional campaigns. We have done numerous bug fixes in the timesheet module. We have also made it more efficient. The most important enhancement we made in the Issue Tracker this time is the ability to use it as a Ticket Tracking software. Your customers will be able to send you support ticket via your website, email or telephone call in. They will then be able to exchange notes and keep track of status using a portal. Our 2014 roadmap is based on what feedback we received in 2013. You, with your input, can steer our development effort to a new direction.